For UNV Associate Civil Affairs Officer Andreas Karpati (Switzerland) assigned to MONUSCO, organising field missions to engage in conversation with local authorities and community members, and understand the reality they live every day, allows him to better analyse the threats and vulnerabilities that civilians affected by armed conflict experience. Goma, Democratic Republic of the Congo: Since November 2014, I have been assigned with the United Nations Organization Stabilization Mission in the DR Congo (MONUSCO) as a United Nations Volunteer Associate Civil Affairs Officer. Civil Affairs appealed to me because it works at the most local level, with a strong emphasis on field presence. I work in the area of Protection of Civilians (POC), one of the key priorities in MONUSCOs mandate. Through its extensive network of field staff deployed to MONUSCO military bases, Civil Affairs ensures that UN peacekeepers are well-connected with the local communities they have been sent to protect. Civil Affairs staff go on patrol with UN peacekeepers, advise them on local power struggles or ethnic conflicts, organise outreach meetings, and support communities in setting up groups to discuss protection and security issues. Based in the Goma Office (North Kivu), my role is to analyse the information sent every day by our field staff and make sure that POC concerns are understood and acted upon at a provincial level. This could mean sharing information with other MONUSCO civilian sections or humanitarian partners, discussing armed group activities with military officers, or engaging directly with state authorities and national security forces for an adequate protection response. An important aspect of my work is organising field missions to analyse the threats and vulnerabilities civilians affected by armed conflict experience. In essence, field missions are an opportunity to engage in conversation with local authorities, civil society and community members to understand the reality they live every day. This helps us to develop a better grasp of the intricate ways in which civilians are negatively affected by armed conflict. For example, even if a village appears relatively safe, women may be reluctant to go to their fields for fear of experiencing sexual violence, which in turn can undermine the food security of their families. In this way, the field missions I help to organise ensure the bottom-to-top flow of information that is crucial for the success of any UN entity. As someone who eschewed compulsory military service in my home country of Switzerland in favour of travelling and volunteering, once I would have laughed off the idea of going on a foot patrol with a platoon of heavily armed soldiers while wearing a bullet proof vest. In the beginning, I therefore sometimes asked myself, Could UNV have selected the wrong person for the assignment, with my previous two jobs having been about supporting youth volunteers and promoting the social inclusion of unemployed individuals respectively? However, after a steep but short learning curve, I came to realize how relevant my civil society and community development background was for my role in Civil Affairs. Modern peacekeeping missions are an ensemble of military, police and civilian elements. Blue helmet soldiers and civilian experts each have unique capabilities, and both of them are necessary to ensure the transition of societies from conflict to peace and development. I therefore believe that UN peacekeeping missions can only succeed if they put the complementarity of their military and civilian components at the heart of their strategy. International Peacekeepers Day is a day of remembrance for those who have lost their lives in the service of peace, but also an opportunity to celebrate this unique partnership between dedicated professionals from such different backgrounds. UN Volunteers make up about half of all civilian staff in MONUSCO and play an invaluable role in ensuring the day to day functioning of the mission. For me, the chance to serve as a UN Volunteer in MONUSCO meant that I could experience the daily life in peacekeeping missions I had previously only read about in books during my university studies. This has allowed me to develop immensely as a professional but also as a person, being exposed to the very real consequences of poverty and armed violence for the first time. 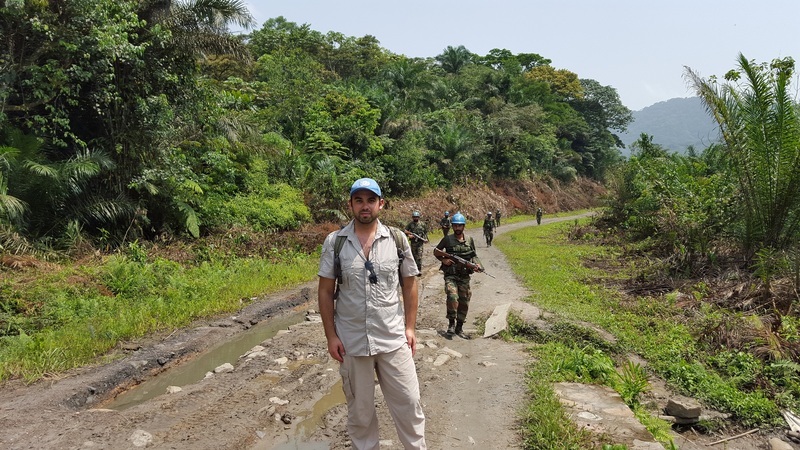 When I eventually leave MONUSCO and the Democratic Republic of the Congo, it will be with a wealth of memories and new professional skills  and a truly in-depth understanding of what peacekeeping really is all about.